In the past week i have been in the very good company of 3 of my blog readers. First of all i met Dot & Derek from New Zealand on board their boat Gypsy Rover at Apsley and we had a very enjoyable hour or so chin wag. Then a few days later John from Plymouth visiting his daughter in Hemel introduced himself and returned later with wife Jenny. Now these two were on a mission, before buying a boat and starting life on the cut they wanted to ask as many questions as possible and quite sensibly jotted down all the answers. 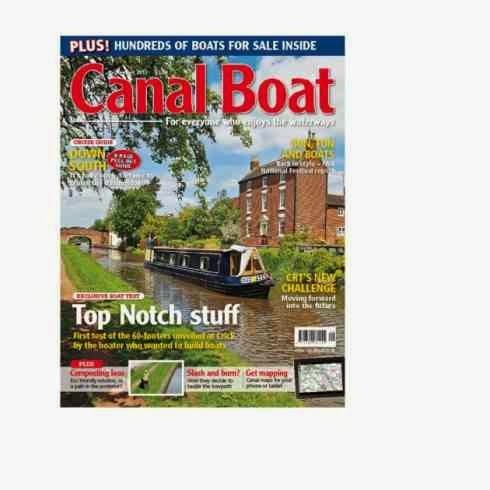 Really the only way to go about boat purchase is to ask as many people the same questions and from the answers decide what would be good for you.It`s what i did and from the answers i started off with some definate wants such as a stainless steele water tank and a cassette type loo. Good luck John& Jenny in your search for happiness. Now after mooring at winkwell into the pub walks Maffi Heading south on Milly M. So a nice drink and a chat took up the next hour or so. So if anyone else is around please say hello and come aboard. Just checked the blog and still only one comment on last posting. Thought there might have been some reaction to the one comment. Makes me wonder if i did the right thing or should i have upheld my right to publish. Mmmmmmmmm! want to upset any child. Passing through one of the locks was this poor Muntjat deer. Being shy animals it is onlyocassionaly you spot one in the trees as you cruise, very sad to see one in this way. Just entering A lock at Apsley Andy/Tinas propeller stopped dead. We pulled it into the lock and filled it to bring the boats upto towpath level. We opened up the weed hatch and could only see a mass of white fluffy fibre. Now this time of year that water is pretty cold so we spent the next 45 mins taking it in turn to cut it all away from around the prop. Tina had a wonderful idea in the form of a hot water bottle so we could get some feeling back in our hands as we each finished our shift down the weed hatch. At the end of the 45 mins it was clear that this was once a sleeping bag, the all round zip being the worst part to cut away bit by bit. 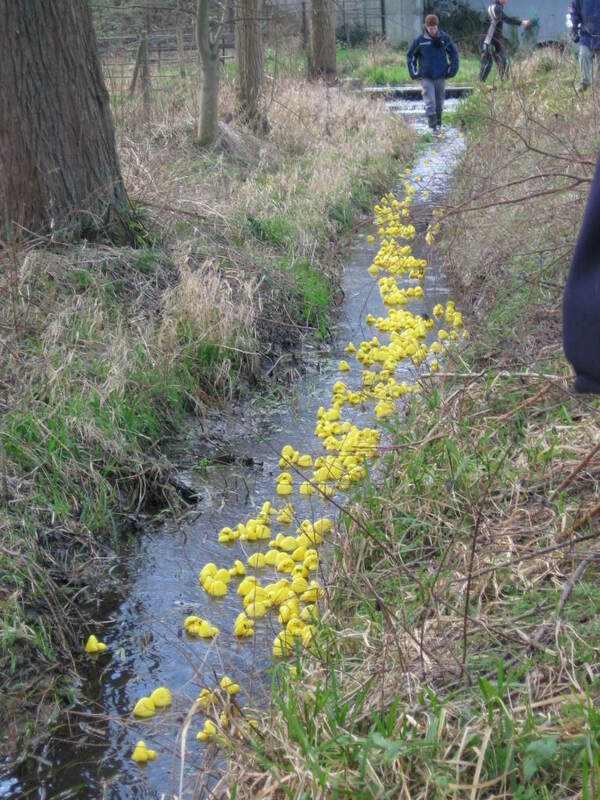 This morning a group from the local Hemel Hempstead scouts arrived on the towpath to set up a duck race. Tickets had been sold to raise funds so that the scouts can attend the World Scout Jamboree being held in Chelmsford late July. 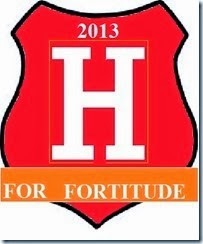 The event will attract 40,000 scouts and leaders from all over. The Jamboree will mark the centenial year of the founding of the scout movement. It was 1907 that Baden Powell took 22 scouts from London to Brownsea Island in Dorset for the first camp. 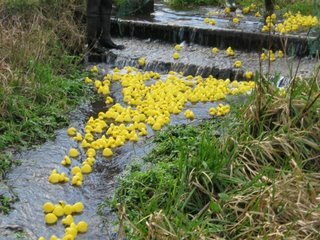 So with 400 plastic ducks saddled up at the start it could be anyones race. The net has been raised and there off picking up speed as they enter Gd. Union Straight. 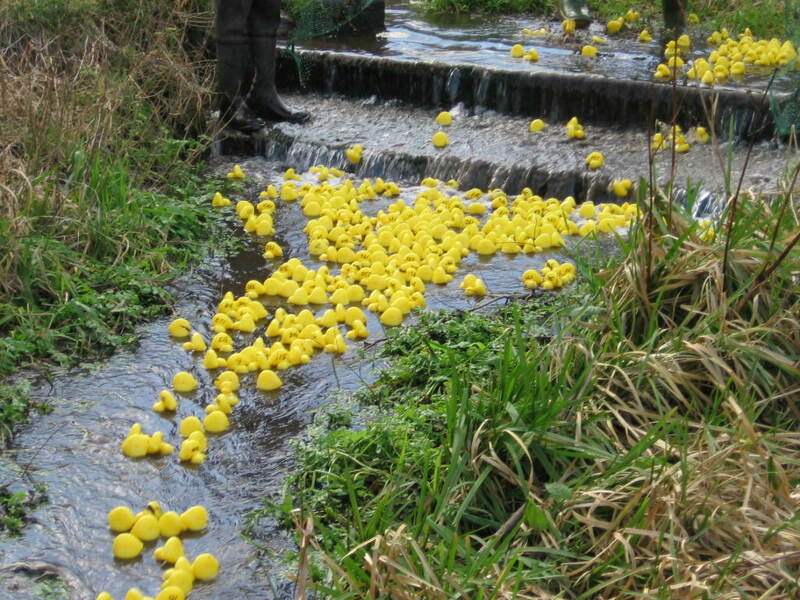 After a very packed start the field opens up and leading is the favourite "QUACKY" closely followed by 100/1 outsider "DAFFY"
And the winner is plucked out after hitting the net first. Following the opening of Batchworth lock we have moved on to Cassio Bridge just a half hour walk from the mooring into Watford and practically within Cassiobury Park with it`s many walks. Sitting here on the laptop i used a canal route planner to set a route to Llangollen. After setting in a few options ie cruising speed, time needed to navigate a lock etc it came up with the following. It came up as 13 days to get to Llangollen!!!!! 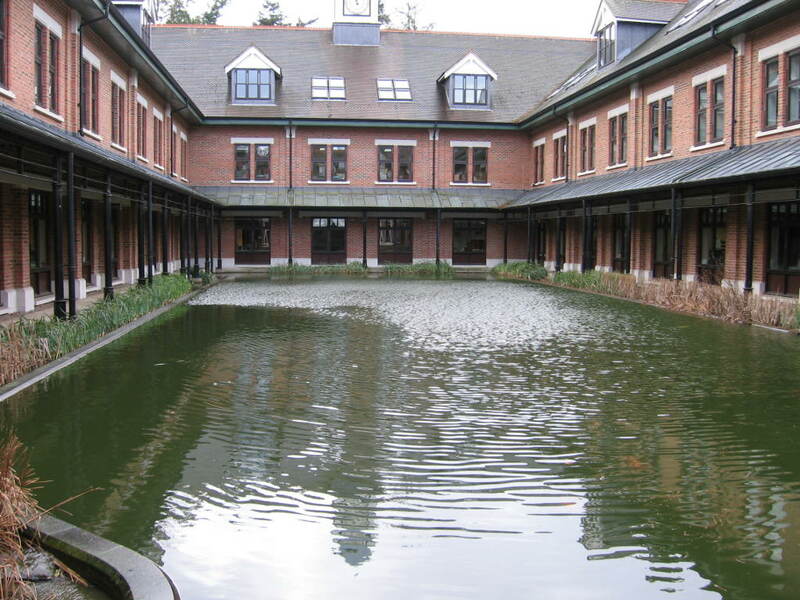 British Waterways head office in Watford. This certainly is quite something. From where i took the picture i was just half way across the car park and if you imagine this distance ALL round the building it gives some idea of the size of the plot of land involved. This building and land has i am told been sold and BW are seeking a new site for it`s HQ. 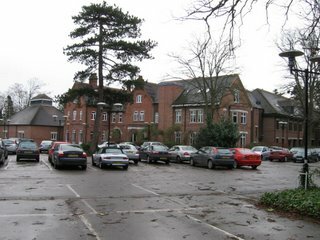 The building will become flats and housing will fill the car park. I hate to think what price the developer will want for each house/flat as just 8 mins walk is Watford Jct. stn. with a link to Euston, also the Watford town centre is 10mins walk. And this is the view from the reception area, as you can see the offices surround a large pond that contains many koi carp. Bet some of you would like to work with a nice view like that rather than maybe just traffic passing your window. 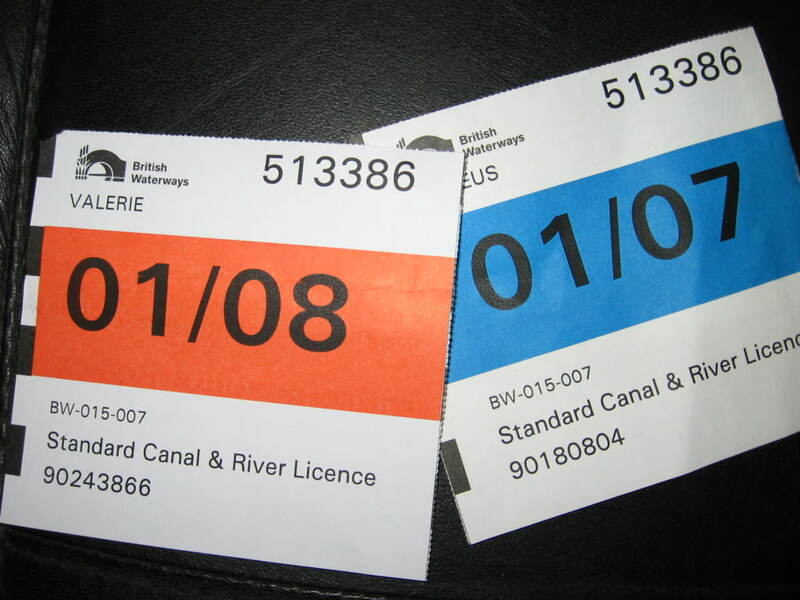 As happens to all boaters at some time during the year it was time to re-new my licence and as i am at Watford it`s so much easier to take a walk to BW head office and collect my new licence discs in person. The fee for my 58` narrowboat was £572.37, this figure being the prompt payment amount. 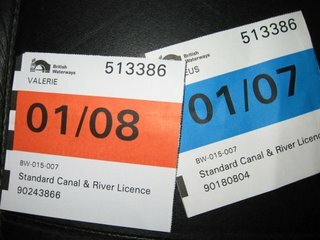 To gain this prompt payment discount, in my case £63.60, the licence must be obtained before expiry date of the old licence. Be nice if the government done this with car tax. Last year i paid £547.20 so this years figure represented a 4.6% increase. That wind sure did bring some trees down. Walking around the lakes all that could be seen were trees some quite big just snapped off as if they were matchsticks. This one fell between 2 boats just 50 yds from my mooring. 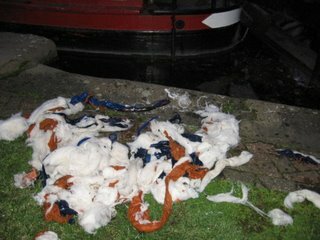 No damage was done but it actualy fell across the mooring rope of one boat so it was a close thing. 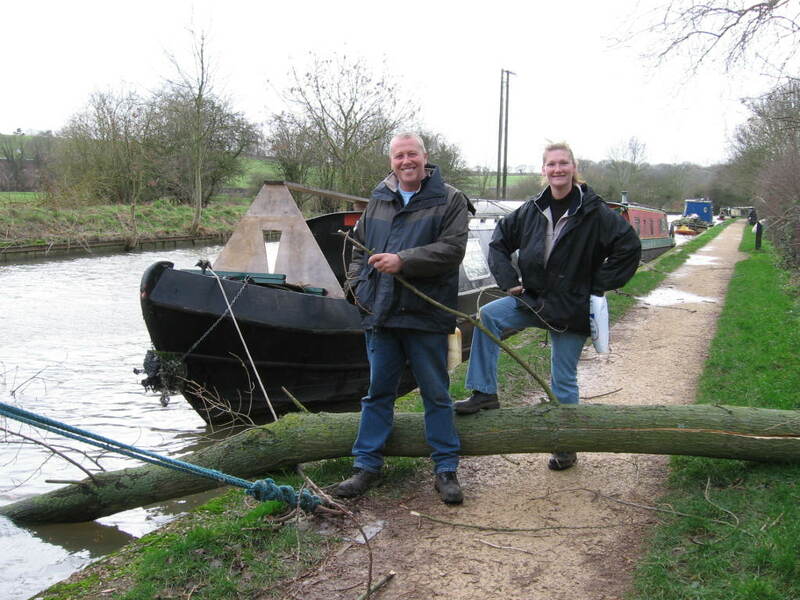 That`s Andy & Tina posing, we are travelling together with John who is still in Uxbridge seeing the dentist so he will catch up and all 3 boats will enter Wales together sometime in April perhaps or when we get there. 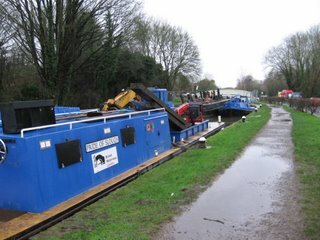 This is the scene at Springwell Lock about a mile back with British Waterways boats complete with new lock gates and crane ready to start work. Springwell is the the lock we needed to get through from Uxbridge as it will be shut for 12 days. Having arrived at Rickmansworth we have only a 6 day wait before we can move on. This will be how things are for the next couple of months dodging around the closures. The old gates being cut up. Hopefully they will leave some for boaters fires. This is the scene 1/2 mile ahead of us. 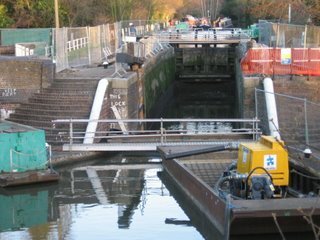 Batchworth Lock is having new bottom gates fitted but hopefully this work will be completed by Friday evening. The new gates are the open ones nearest camera and weigh in at 3 ton each and made of oak. They were last re-newed 30 years ago although they have had some maintenance during that time. Well it`s been a long time since we moved but Sunday morning will see us moving all be it slowly in a northerly direction. The first thing to be done is to pass through Springwell Lock before it closes on Monday. 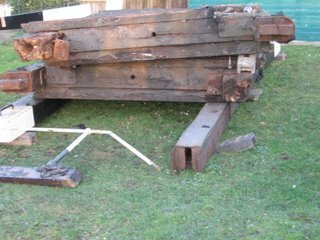 We then will have to moor up for a few days to await the opening of Rickmansworth Lock on the 19th. Between here and the Milton Keynes closure that is in force now untill Mar 16th (68 days) there are 14 other closures most of which are to replace lock gates. A lot of these closures will be open by the time we reach them. Once we have passed through Ricky the next closure will be just pass Cassiobury Park Watford on the 29th jan. 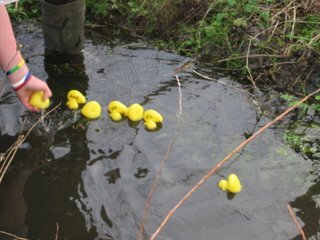 If we don`t get through it will mean a wait of 2 weeks. At this point we will study the timetable of closures and plan the next few moves. So folks it`s back over old ground but hey i really don`t mind it`s just the pure freedom i enjoy and summers on the way, each day now that old sunset gets a little later. 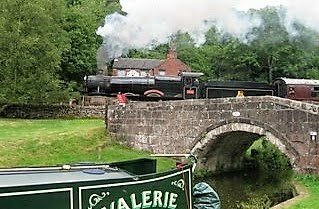 Wales is our destination via Birmingham hopefully after Easter and before the holiday season starts as the Llangollen gets busy in the summer season. 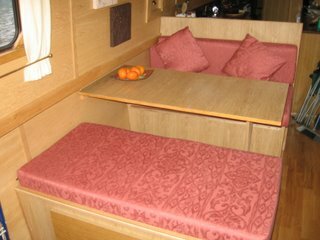 So folks if i am coming near to you please don`t hesitate to E Mail and you will be welcome to come aboard and have a cuppa at the new dinette. The Dinette in day mode room for 4 people to dine. The seat nearest the camera has 2 drawers fitted but unlike the other seat has no back rest. The idea of this is that people can sit facing into the saloon. 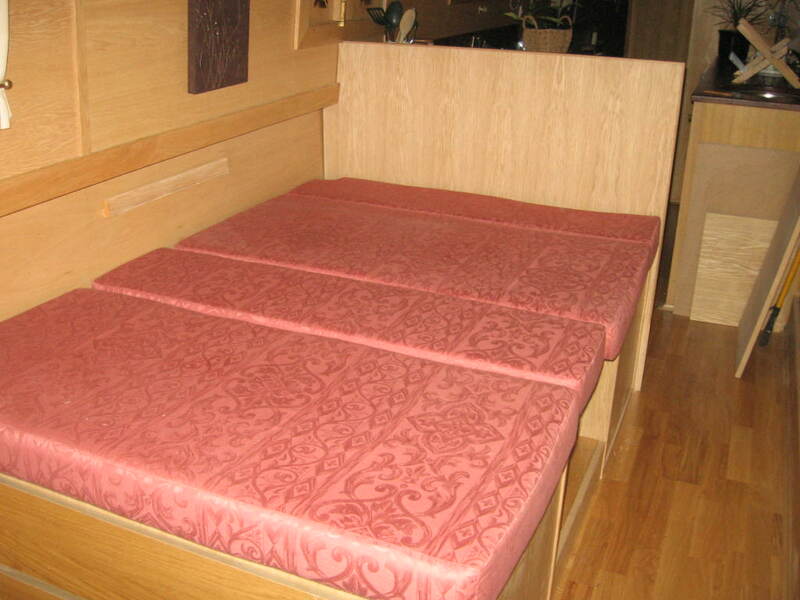 Below the other seat is a lift up lid giving access to a large storage area ideal for bedding plus much more. The table has been lifted out the leg folded under it and the table then rests on 2 supports between the 2 seats to create a double bed, ideal for visitors.